I'm in the midst of watching the stream of the live keynote on this event, so will report back later, but wanted to share this news as soon as possible. This isn't a Windows phone - it's a highly-focused feature phone that's targeted at a certain group of users. It integrates the full Zune client as well...more to come! The Kin Web site is also live. Yey, we have our first official phone that supports Zune and Zune Pass. The Kin-1 looks to be the most unique and probably will be the most common device among Kin users. 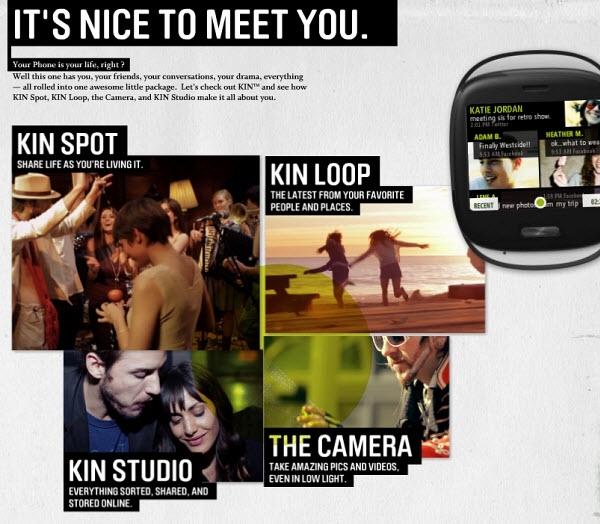 Beyond Zune, Kin Studio is impressive. I'd like to see them make this available to Windows Phone 7 devices as well. If we do see a 2nd generation, Zune HD...I have to wonder if they might incorporate some of Kin functionality. Ok. This is a Microsoft device, right? This isn't a spoof or an April Fool's post, correct? This is the second phone announcement in a row from Microsoft that has me excited. They really do get it after all. And they can keep secrets! And they can announce a product just before it is to appear in stores! Wow! So far there hasn't been a wrong note on the Kin launch. The name is darn good. The UI clearly shares some roots with the WP7 but seems even more lively. The Kin Spot is very clever. And so is the Kin Studio. I am way out of the supposed target market for this device, but I want one. I was pleased to see a statement from a Verizon rep that they felt parents (and grandparents like me) would love the device for posting pix and video of the family. That was exactly what I was thinking when I saw the product. Check out the first unboxing of the Kin Two on the ZDNet site and you can see that as with the Zune, Microsoft has also remembered that packaging is part of the appeal of a product. Sorry, not in the know. What does US$30 a month get you in terms of data? And here I'm thinking just the opposite. Why is Microsoft competing against their own platform? Plus, the Kin has no developer experience, no installable apps as far as anyone can tell. Why not make unique formfactors based on WP7? I see they want to "eventually converge", but what will the upgrade story be? I find this platform very confusing. I understand that this is a successor to the Hiptop (Sidekick) for the youth market. But the Hiptop had a number of powerful features that many kids used that this seems to lack -- IM, email, and installable apps. Somewhat interestingly, while Apple takes credit for the App Store, the real credit is to Danger, who had a centrally-managed app store 3+ years before Apple did! I liked the Hiptop platform a lot, but this is three steps back as far as I can tell. The Hiptop also had aggressively-priced data plans through T-Mobile; will Verizon do the same? I am just as curious to see the critical and market response, but determining whether something is a hit based on the opposite of others' reaction is dangerous. Janak, Microsoft isn't competing with itself with the Kin and other WP7 devices anymore than it competes against itself with various Windows versions (I know some people don't understand that either, but it really makes perfect sense.) The Kin is really a subset of the coming WP7 devices aimed at a specific set of users....those 15 to 30 and then people like me. There appears to be confusion about what the Kin offers, but it does offer e-mail and texting. Microsoft has said they consider their implementation of text to be IM like (whatever that means) but that they are open to adding IM if users want it. I really don't see the lack of downloadable apps feature as the big deal that others do. I can download apps on my Touch Diamond 2. I've downloaded exactly two- and one of those I later deleted. I know there are people who are forever downloading apps however. They won't want a Kin. The one thing that I think MS may have missed was games, as portable games would seem to have the same target audience as the social network crowd. But MS did 50K hours of interviews with that audience and I didn't, so I'll cut them some slack on that point. I could also hazard a guess that with the Zune software already on the Kin, that adding games might have been seen as undercutting the potential market for WP7 devices. I gather that neither Microsoft nor Verizon are planning to set the world on fire with the Kin. I think they just want a successful product that creates some mind share in the target audience for Windows Phones. I think they've hit on that with what I've seen of the two devices. And as for the negative reaction to the announcement on some tech sites- it is similar to what I saw with Windows 7 and with Windows Phone 7. We already know how wrong that gang was about Windows 7 and I believe we will see they are equally wrong about WP7 and the Kin as well. But they aren't a subset, at least not yet. They pretty clearly stated that it's not WP7, at least not yet. Also: what kid in the age group of 15-30 doesn't want downloadable apps? They had it with the Sidekick, and now they have it with the iPod touch, and even with the Zune! That's like Apple not including iChat on the iPhone and just offering SMS. Don't buy it. There are many of them, if App Store statistics are correct. I have one word for you: games. I see so many people on the subway using their smartphones to play games. I see you note that in your post, but I don't think the 50 hours of interviews are necessarily right. Microsoft user tests everything they do, but if you do the user testing wrong you're not going to get good answers. Well, I think they're a huge step back from the old Danger platform, and if they're not planning on setting the world afire, why did they spend many millions of dollars on it? We shall see. I am utterly unconvinced of the Kin as a platform. WP7 is already a promising platform, with a lot of nice changes, a nice user experience, a nice app experience, etc. The Kin has none of that. I've seen plenty of dumbphones in this category, and the Kin is just going to enter another crowded market with an offering that will compete against the Samsungs etc. Janak, we clearly disagree about this device. Fine. We'll see who's correct shortly. Allow me one correction, it was 50,000 hours of interviews with the target audience, not 50. I am well aware of Microsoft's user testing; I've done it myself many times, going back as far as Windows 95. I can't believe that in all those hours of interviews the subject of games and downloadable apps was not raised. I would like to hear more from Microsoft about those discussions. Any sample testing can certainly go wrong, but I think the results obtained from a sample that large certainly has a high degree of reliability.